In the last issue I discussed and offered up some tips and advice on landscape photography. Many of you reading the title of this article might be thinking “now didn’t he talk about this stuff last time ? !” Generally the terms ‘landscape’ and ‘scenic’ would go hand in hand but to my mind I see them as different subjects and would like to treat them as such here. Let me try and explain how and why I see them differently. During our hunting trips (especially the overnight or multi day trips) we often cover some vast amounts of country some of which is up high on the open tops while contrastingly much of it is sometimes at lower altitude and deep in the bush. And naturally a lot of ‘in between’ country along the way. The ‘views and vistas’ we encounter while out hunting (I think) can be categorised into one of two types – landscape or scenic. To me landscape images should have components such as vast unending panoramic views, far reaching and expansive terrain and lots of ‘space’. These types of shots are usually quite powerful drawing that power from the sheer enormity and majesty of the scene. A couple of examples might be that wide reaching scene that lays beneath us, seemingly as far as the eye can see, as we reach the top of a high ridge or mountain top or perhaps the view of a massive head basin extending up and in front of us as we break out of the alpine bush edges in the valley floor. You get the picture. Scenic images on the other hand, I see as involving far less scale, much shorter distances, have more specific, closer subjects and as a whole will be so much more intimate to the viewer. Most times they will probably not include the sky and generally exclude large prominent elements while drawing their power from composition of the image. A scenic image will focus on small, unique parts of a wider landscape. Couple of examples showing what I mean here might be the beautiful bright red flowers of a Southern Rata dangling in front of a small but pretty waterfall somewhere in South Westland. Or a simple shot of a gnarly trunk of an old beech tree which has out lived all its siblings and is now, contrastingly, surrounded by a grove of young saplings. I hope you are able to see what I’m differentiating. In a nutshell though, ‘expansive’ would describe landscapes and ‘intimate’ would be a great description for scenic. I dare say the text books and photography boffins don’t share my views and separation of the two categories but there you have it! So with this separation and distinction in mind I’ll now get stuck into some specific situations (or examples) of what I consider ‘scenic’. Naturally, most of the tips, advice and suggestions that were discussed in the ‘landscape’ article can also be applied to scenic images. A hunting trip without some sort of contact or interaction with a river, stream or creek of some sort would be a rare trip indeed. 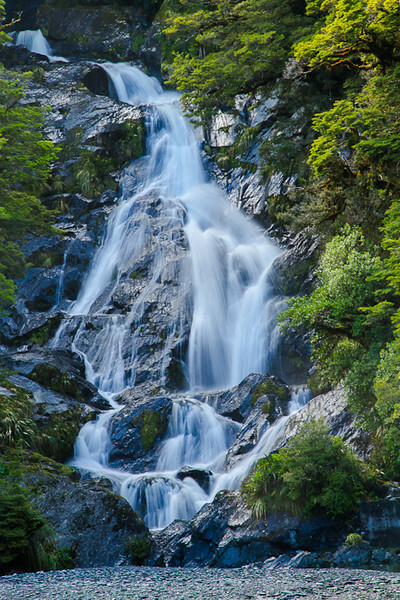 Rivers and streams are very lively and dynamic forces of nature, full of power and energy. Because of these characteristics they make for wonderful photography subjects. By using the river/stream as a ‘leading line’ not only are you giving the image a pathway of direction but you may also provide a sense movement in the shot. Remember to look at the scene from various angles and perspectives. It won’t take long to realise how drastically a sometimes small change in position can make to an image and that movement or ‘life’ may be given to the shot by that same change in position. Let’s use a typical mountain stream as an example. By getting yourself and the camera down very low to the water and using a small aperture (to ensure the very close foreground just in front of the lens is in focus as well as the back of the image) you are able to capture the bubbly aerated water of the river in minute detail. This in itself will produce that sense of motion. Remember too that the wide end of a lens (zoomed back) will help increase the DOF at any given aperture. Water reflects light … greatly. What this means to the photographer is that there will be a huge dynamic range (the ratio between the maximum and minimum measurable light intensities) that the cameras sensor will have to cope with. Unfortunately sensors are not always capable of recording this whole range. So, as in landscape images which have a very bright sky, these scenic river shots will also have very bright portions within the image. ie, light reflecting off water surfaces. A decision sometimes has to be made with exposure as to what you will sacrifice. Either decrease the exposure to keep some detail in the bright water/river (which will mean loss of detail in the surrounding terrain) or increase the exposure slightly to maintain detail in the surrounding terrain but at the expense of a bright (‘blown out’) river. Two images above show the two exposures talked about when dealing with reflective light off water. First one shows a correct exposure over the whole scene except the waterfall which has been over exposed and consequently lost detail. 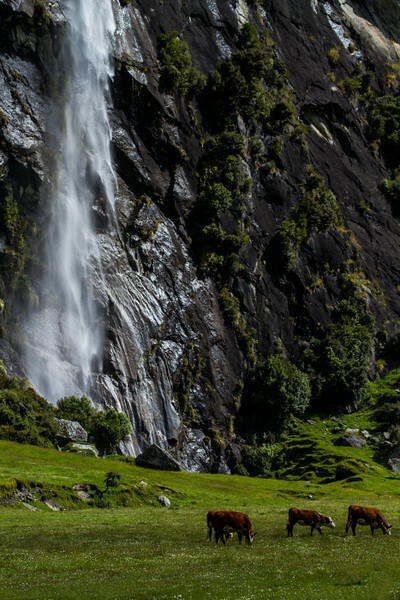 The second has been exposed for the waterfall in mind. Now you’ll find the surrounding terrain (rest of the image) is under exposed – dark. At this point it’s entirely down to the individual as to what you would like to retain correct exposure in … the water or the bluff and foreground. In my opinion a compromise is required here. That is, an exposure which is between the two examples. You won’t get correct exposure in both parts of the image but by compromising, both won’t be ‘too far gone’ to ruin the shot. While we’re talking about scenic rivers and streams I might as well discuss how to create those wonderfully smooth and silky river and waterfall images. Tourist shop postcards use them, every pictorial coffee table book will include a host of them and everyone loves them. The main ingredient for these types of shots is simply a long exposure, a slow shutter speed. Now, slow shutter speeds will have consequences – camera shake causing blurriness, anything in the scene that is moving will now be blurred and the dreaded over exposure. So the first and absolutely vital piece of equipment is a tripod. With shutter speeds ranging from half a second up to thirty seconds or more the camera must be totally still for the entire duration of exposure. A good solid tripod will negate the camera/hand shake problem and to a certain degree will help with any moving components of the image such as swaying trees and grasses. Bear in mind that not even a tripod will help to ‘stop’ this sort of movement if the wind is anything more than just a very light breeze. If you’re not happy with some out of focus parts to the image then the best bet here is to simply wait for a day when conditions are very still. Which brings us to the last ‘consequence’ – over exposure. The length of shutter speeds involved in obtaining these shots are so long that compensating with decreased iso and aperture (the other two of the ‘big three’ ) to gain a correct exposure will be impossible. A very simple answer is to try and take these shots on overcast, dull days when ambient (natural) light is very low and even last thing in the afternoon/evening. Low ambient conditions will still only allow good exposures up to roughly a second or two at most. For longer exposures the scene must still be darkened somehow. The only way left to do this is at the camera end of the equation, so to speak. That is, filters on the end of the lens. Specifically, neutral density filters. 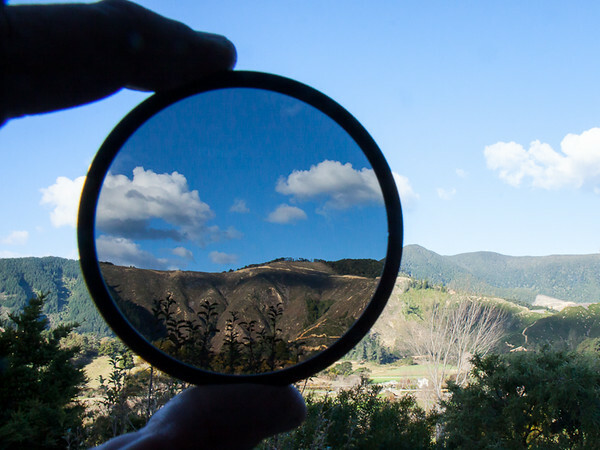 A neutral density (ND) filter is simply a darkened sheet of glass screwed onto the front end of the lens. An ND filter transmits only a portion of the light that hits it and when that reduced amount of light comes out the other side (into the camera and onto the sensor) the colours should be completely unaffected. What portion of light that ‘gets through’ is dependant on what grade the filter is – how dark it is. Manufacturers grade their own lines of filters differently but in a nutshell, each successive ‘grade’ will be twice as dark as the previous one. ie, it allows half as much light through as the one before it. Which one you want or need will depend entirely on the scene, situation or effect that you’re trying to achieve so I can’t really give advice on which grade to get. 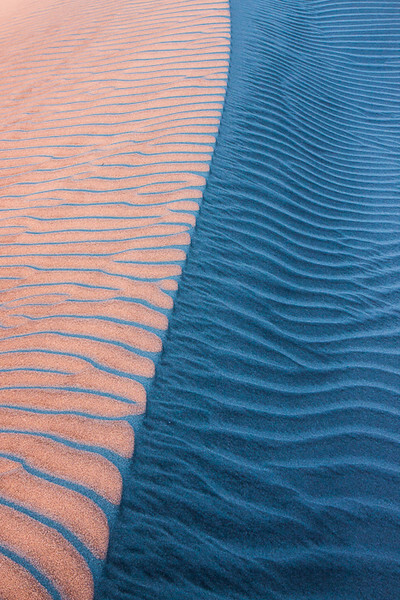 Above photo shows two ‘grades’ of ND filters. 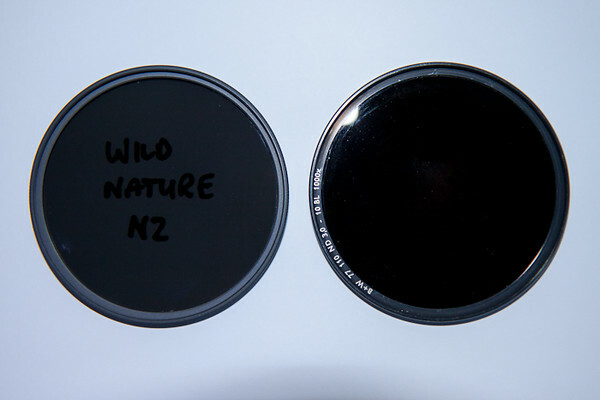 I’ve written “Wild Nature NZ” under both of these filters to illustrate just how dark these types of filters can be. ( 1/250 @ f/2.8, iso 800 – flash employed ). Image above demonstrates the effect of an ND filter. ( 1/60 @ f/22, iso 800 ). The image above shows what an ND filter can achieve. This shot was taken very early in the morning well before the sun was up. Two to three foot waves were crashing in onto the beach every few seconds. A very dark ND filter over the lens allowed the shutter to be opened for a whopping seventy-five seconds without blowing out the image. As you can see it has also ‘smoothed’ out the rough sea conditions and given the ocean and beach a lovely smooth, silky, dreamy look. Even the clouds in the distance have moved during the seventy-five seconds making for a pretty cool effect. This same effect can be achieved with river and waterfall images. A tripod was an absolute must in this situation. 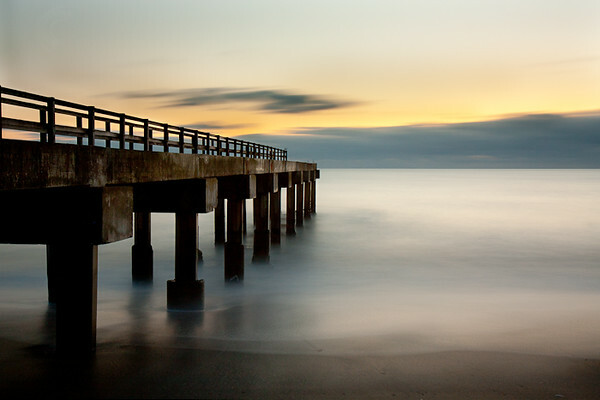 A ‘graduated’ filter is also very popular in landscape and scenic photography. These types act in the same way as ND filters except that only half of the filter has been tinted. How many times have you taken a landscape/scenic shot with a lot of sky in the frame and had that area come out very bright, almost white ?? Again (like the reflective water) the camera cannot cope with the huge dynamic range you’re asking it to record. A ‘graduated’ filter is a great tool in these situations. By placing the tinted, darkened half of the filter at the top of the image a correct exposure can be obtained for just that area (the sky) without darkening rest of the scene. A nice simple way of fooling the camera into thinking the bright area of an image is darker. The third and probably the most popular filter I’ll touch on is a ‘polarising’ filter. All you fly fishermen and women will know where I’m going with this one. Screwed onto the end of the lens just as the other two types, the polarising filter’s job is to take away nasty glare in the same way as polarised sunglasses take the glare off the water’s surface to enable us to see those cagey trout. The most impressive result using these filters is the much enhanced colours that the glare otherwise robs the image of. Our love of hunting takes us into some pretty awesome country where nature provides us with so many wonderful things to experience and see. We’ve talked about the wider landscape type shots (last issue) and now the more intimate scenic style of images. We can go one step further, so to speak, and discover part of nature that often goes unnoticed by many and which is yet another source of some great photo opportunities. A kind of micro world of nature. And the best way to see, witness and experience this smaller micro world ?? Slow down, stop, get down on your hands and knees or all of the above. It’s not until you take the time to just stop and have a really good more detailed look at your surroundings that you begin to find some really cool stuff happening in nature. Slowing and/or stopping are obvious methods of ‘seeing’ more. However (and I’ve talked about it in almost every article in this series and can’t emphasize it enough) angles and perspectives are one of the photographer’s best tools. The getting down at ground level thing (hands and knees and on occasion right down onto your elbows and belly) will give the whole scene/image a much greater more personal appeal. Now, photographing this micro world doesn’t necessarily need a fancy macro lens. 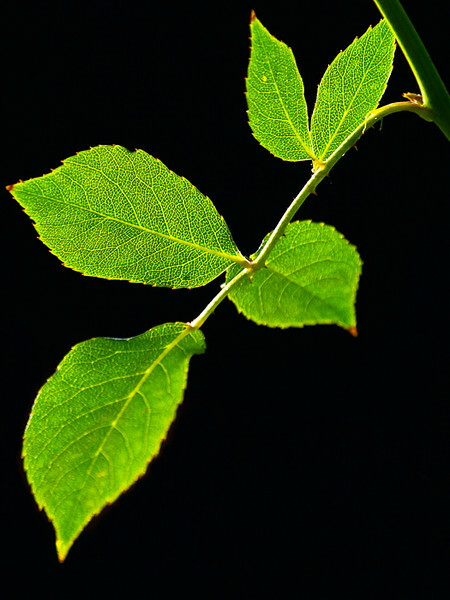 By maximising the abilities of any given lens some really neat close up shots of nature maybe achieved. 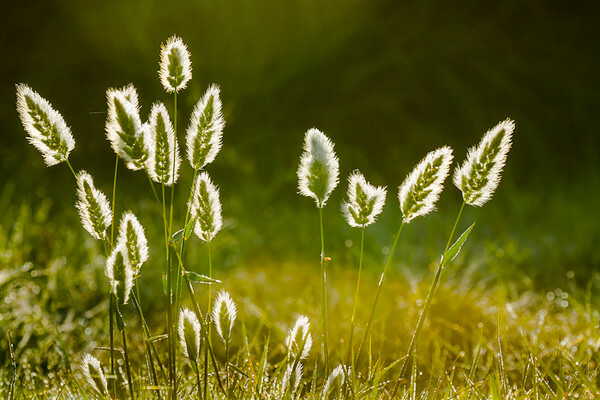 A lens will have a minimum focusing distance – the closest distance from the subject that it will achieve focus. Some are closer than others but by working at or near to this minimum distance you’ll be surprised what even the lesser, cheaper lenses produce. If you are using a zoom lens then work at the longer focal length end of the range. (For example, use the 55mm end of an 18-55mm zoom lens). This will simply mean that you are able to capture a ‘tighter’ view of the subject/scene. That is, a closer more detailed image. I bet most of you reading this have heard the term of a photographer “having a good eye”. Basically this means that someone has vision and sees things that most others don’t see. Just as importantly, that person is able to record what he or she is seeing. This applies so accurately to ‘abstract’ images. By taking advantage of and combining many of the techniques already mentioned in this photography series such as angles, perspectives, composition, focal lengths, lighting etc along with a bit of lateral thinking and altering of preconceived ideas you will be able to achieve some very cool, interesting and just plain different images. I often jokingly refer to these shots as ‘arty-farty’. I also see these types of images as a great way to experiment with settings, to learn more about your gear and broaden your whole photography knowledge. Judicious composition combined with some golden hour lighting produced this ‘abstract’ image of a Kahurangi Coast sand dune. ( 1/40 @ f/10, iso 400 ). When considering this article and its topic (scenic and ‘intimacy’ of an image) I think the over riding message is not so much technical information but just to slow down and have a much closer, more detailed look at what is going on around you. I know that you’ll be pleasantly surprised at what you find. And remember to take advantage of these new discoveries by using the opportunities to experiment and try new things with your photography.